In the study Drusen ooze: A novel Hypothesis in Geographic Atrophy, recently published in the scientific journal Ophthalmology Retina, Dr. Jordi Monés, MD PhD, Director of the Institut de la Màcula and Medical Director of the Barcelona Macula Foundation, together with Míriam Garcia, MSc, Dr. Marc Biarnés, PhD, Dr. Aparna Lakkaraju, PhD, and Dra. Lucía Ferraro, MD, describe new findings related to drusen and propose a mechanism of progression to geographic atrophy (GA) in patients with age-related macular degeneration (AMD). AMD is the leading cause of irreversible sight loss in developed countries. It is an inflammatory, chronic and progressive condition that gives rise to a loss of central vision due to the degeneration of the macula (the central region of the retina). GA is associated with loss of visual acuity due to loss of retinal pigment epithelium (RPE) and photoreceptors and is a consequence of the progression of AMD. Through the use of imaging techniques like optical coherence tomography (OCT), the aim is to find out more about the earliest events in the atrophy process in order to understand its mechanisms better and thereby be in a better position to seek a way to halt or prevent atrophy progression. In the genesis and the atrophy process there are still many mechanisms and processes that are not understood. Geographic atrophy progresses with an average of 1.5 to 2.6 mm2/year. The study analysed 48 eyes of 33 patients with soft drusen (extracellular deposits located beneath the retina, composed of lipids, proteins and other elements that accumulate and increase the risk of suffering the most advanced forms of AMD). 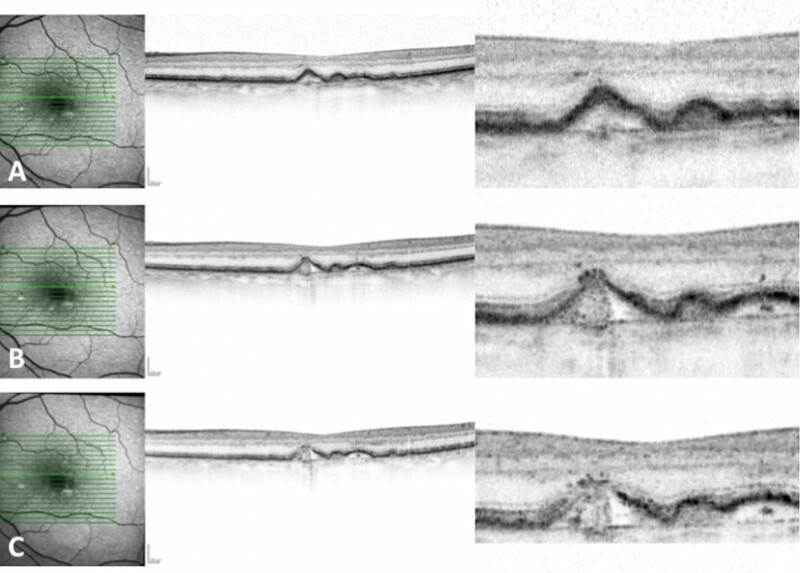 The drusen were analysed by OCT and other retinal imaging techniques to characterise the association between their collapse and GA during a monitoring period of at least 18 months. Of the 48 eyes studied, 19 presented at least one drusen that had collapsed in this period (39.6%) and the following features were analysed: zones of hyperreflective RPE, i.e. PRE located on drusen with an increase in reflectivity; one or more hyperreflective dots (HRD), which are zones of hyper-reflective RPE but discontinuous; and isoreflective dots or drusen ooze in the photoreceptor layer that show greater reflectivity than that of the photoreceptors but less than that of the adjacent hyperreflective RPE. Analysis showed that 66% of the drusen that displayed isoreflective dots developed atrophy characteristics in the following two years compared with 4.9% of drusen that did not present either isoreflective dots or HRD. Therefore, the presence of drusen ooze appears to precede drusen collapse and therefore could play a crucial role in the cascade of events that lead to drusen collapse and the development of GA in a short length of time. The appearance of HRD together with the drusen ooze represents the point of no return in the development of GA. The authors hypothesised that drusen ooze could activate the apical surface of the RPE, exceeding its capacity to maintain the environment of the photoreceptors, which would lead to the death of the RPE, probably through pyroptosis and necroptosis (cellular death mechanisms measured by the inflammation in RPE degeneration in the context of the GA). This would be followed by the continuous, uncontrolled release of intracellular material, which would activate the neighbouring RPE cells even more, would propagate cellular death and would promote the GA progression as a vicious cell-to-cell cycle. 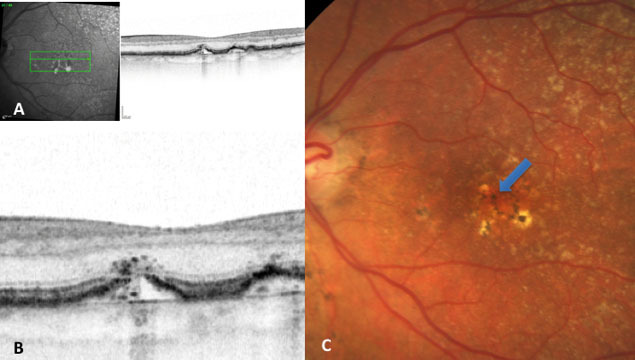 Image A: infrared image of the retina and alongside an OCT section in which some drusen are seen (in greater detail, image B). Image B: a drusen that displays release of material to the other layers of the retina (drusen ooze). 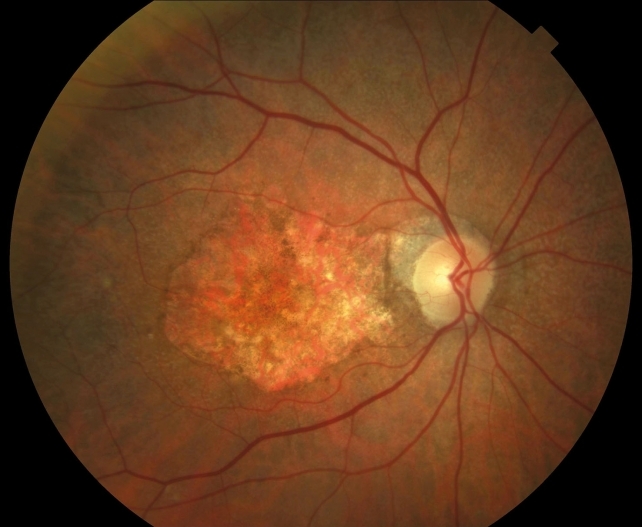 Image C: Retinography of a patient with numerous drusen, hyperpigmentation and hypopigmentation. The arrow indicates the drusen we saw in the previous OCT image. The strength of the study lies in the detailed, precise, dynamic and high-resolution SD-OCT observations of the drusen features and of the progression to GA. These findings may contribute indirectly to increasing our knowledge about the cellular mechanisms involved in GA, and encourage the use of SD-OCT to complement histology to elucidate cellular pathways in retinal diseases. Identification through SD-OCT of a drusen that is commencing the atrophy process. A) A drusen without irregularities is observed, but with hyperreflectivity in the superimposed RPE. B) The RPE shows irregularities and hyperreflective dots above it. C) The damage in the RPE is more evident with the presence of isoreflective points— drusen ooze.